How can this be? What can we do about it? Did we really put a man on the moon thinking like this? We have talked about the magnificence of the brain and its unique features. So how is it that all the issues in these Thinking Error articles can be so? We spent about 88,000 years as hunter gatherers. We spent about 12,000 years as agrarians. And we only spent roughly 255 years (.00025% of total life) since the industrial age began. We have low conscious information capacity. Conscious: no faster than 60 bits/sec. Miller’s Law says we retain 7 +/- 2 items at the same time. Memory is not a recording. Vision is not a camera. 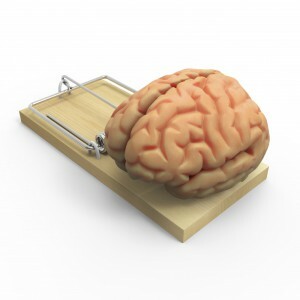 The brain generates beliefs that are predictable with modest changes. Expectations heavily influence (determine?) our perception. Ultimately, biases can have both a personal and generic context. Just to compound the situation of thinking errors still further: the more time you spend making decisions (including trying to avoid the hundreds of “traps” that are out there) the lower your overall willpower will be. We will go into the brain in much more detail but for now take note: the brain is only 2 percent of your body weight but burns 20 percent of your energy. So when you are energy depleted (from decision making) you need to be careful (mindful). Add to this that when the brain pushes to conserve energy, we do things such as to reduce issues to (too) simple form and group (unrelated) items. With all this in mind one starts to appreciate our ‘exposure’ to thinking errors. The reason I bring this up is that in business we are rarely only accountable to ourselves so we have a big responsibility (so-called fiduciary responsibility) to mitigate against thinking errors. So what do we do? Obviously, we have made advances since we now know we have a challenge and what that challenge is. Some concepts seem self-evident from what we have been discussing and are easily implemented. Much literature suggests several approaches. Debiasing: encourages you to control (i.e. think about) the decision process rather than making the automatic choice. Incentives: monetary rewards and accountability linked to increased accuracy. Modifications: modifying cognitive processes through altering of the focus of attention for a task. The approach that works for Kirchner Group is similar to others in some regards, but we are particularly focused on the fact that perceptions are driven by an individual’s frame of reference so we fundamentally rely on several points of view. Remain overtly skeptical: we question our decisions until we run them (mentally and sometimes in writing) against a checklist. Rely on committees: particularly for ‘investment’ decisions, we rely on (for example) investment committees who do not have a vested interest in the process. Do the right thing: Finally, (actually initially, but it stands out better here) we start from what is the right thing to do? Hopefully this series has opened up a new world (or expanded on old theories) and provided you with the ammunition you need to fight your personal status quo. However, I know that is a decision (fraught with cognitive biases) that only you can make.